The Clover Club cocktail, with Bluebird Distilling Juniperus Gin, lemon juice, egg white and raspberry syrup. Are you harboring a broken heart, unrelinquished angst, or just a general unpleasant disposition caused by a former flame who has done you wrong? If so, you may find catharsis at the Bourse this Valentine's Day. To commemorate singles awareness day, The Bar by Bluebird Distilling (housed in the Bourse), invites one and all to come by with a photo of their ex for a special "Shred-Her/Him at the Bourse" occasion this Feb. 14. The shredder will be available to do damage starting at 11 a.m. until closing. Other than the weight of relief at seeing the face of that as*hole finally destroyed, you can also score a complimentary cocktail from Bluebird. 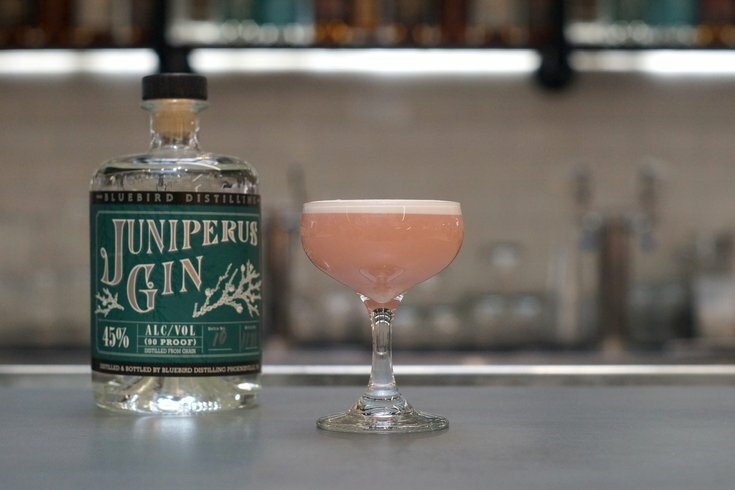 Shredders will receive the Clover Club cocktail, which is made with Juniperus gin, lemon juice, egg white, and raspberry syrup. The TAPS Fill Station will also be serving Schwarzbier (black beer for your cold black heart) throughout the night, starting at $5 for 12 oz. Even if you're happy living your best single life, or even if you're in a nice, healthy relationship, destroying a relic of your past seems like a great way to get a free drink. Cheers!